I was thrilled to be asked to try out the new summer range of clothes from USA Pro. line of affordable, feminine, fitness wear designed for a range of holistic activities including Yoga, Pilates, and Tai Chai. The collection, which consists of tops, pants, and shorts, is made out of bamboo fabric which possesses many benefits. The benefits include UV protection, cooling, hypoallergenic, antibacterial, and ultra softness. The Yoga Padded top, and bottoms are so ultra comfortable and loose fitting. Just what you need when you are practising yoga, body balance, Tai Chi etc, clothes that were specifically made for these kinds of activities. WSR would seriously recommend these products. The prices are crazy cheap, you won't find prices like it anywhere else. The Ladies USA Pro Yoga Padded Vest is ideal for yoga and training sessions down at the gym with a loose fitting design round the stomach and a fitted and padded bust for a super comfortable fit. This yoga top also has simple racerback, spaghetti straps and is finished off with a reflective USA Pro logo printed to the bottom, left side of the top. 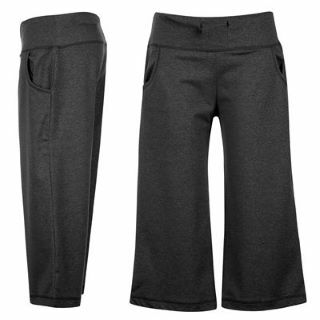 These ladies USA Pro yoga trousers come in a 3/4 length style with a loose fit and open hem legs that allow for great freedom of movement that make them ideal for your yoga sessions or pilates classes. The ladies 3/4 yoga pants are complete with a wide stretch waistband with drawstrings for a great fit and feel, finished with the USA Pro branding to complete the style.